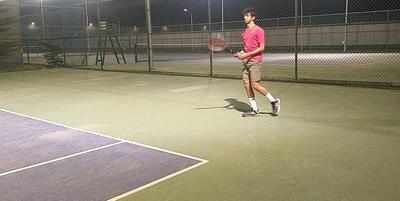 The first round of the much-awaited Annual Tennis Championship, Tennisanity 2.0, organized by the sports club of Bennett University, took place on March 27. Thirty-two players competed against each other to enter the second round of the tournament. Sharing his excitement moments before the first round, Gaurang Mandavkar, second-year BBA LLB student said, " We are looking forward to the matches and it is going to be exciting as there are fourteen matches scheduled for the day." Three matches were held simultaneously in three different courts and each round was a nail-biting experience for the spectators. At the end of the first round, of the 32 players, 13 qualified for the second round of the championship. Satisfied and content with the enthusiastic participation of the students, Abhimanyu Sharma, vice-captain, Bennett Tennis team, and a student of Times School of Media said," The standards of the tournament have certainly gone up this time as we witnessed some tough matches today.” He further added that this time there was more participation from beginners. Of the 13 players in the second round, three made it to the third and the final phase of the tournament, which took place on April 3. In the first match of the final round, Mandavkar defeated Tejas Parikh, first-year, BTech CSE student to enter the grand finale. The last round of the match was between Mandavkar and Shaurya Chauhan, first-year BBA student. The tournament ended on an enthusiastic note and students are now looking forward to more such tennis tournaments.